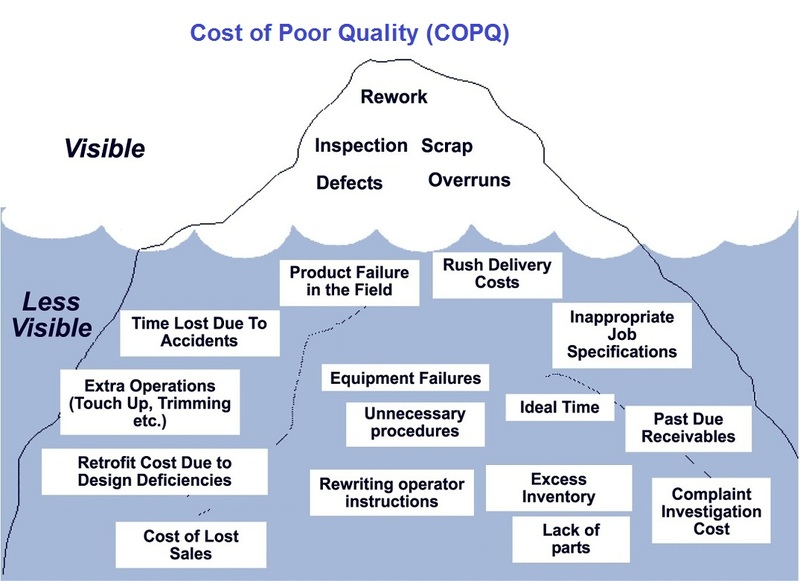 Cost Of Poor Quality – COPQ = Cost Of Poor Quality Analysis – Cost Of Poor Quality Framework – Cost Of Poor Quality Business Methodology – Cost Of Poor Quality model is a Lean framework stating that organizations only see symptoms of poor quality such as rework, scrap and rejects. However, what they do not see is that poor quality affects sales, results in longer cycle times and affects many other business aspects. The classic depiction of COPQ is an iceberg with only a small portion of the symptoms visible above the surface. COPQ is a Lean Six Sigma approach to solving business problems. Below sample images are examples of Cost Of Poor Quality used in business management.